The choir had a busy run-up to Christmas starting off with a Flashmob performance of the Hallelujah Chorus from Handel's Messiah in the Tesco's Chilwell store, with the full performance of the oratorio at Christchurch, Chilwell on November 29th. This was followed by three Christmas concerts at Patchings Arts Centre, West Bridgford Methodist Church and an informal concert at Cobden Chambers in central Nottingham. 2015 started with a highly successful “Come and Sing/Play“ event in January. This was extremely well supported, with well over 100 participants. Once again we were delighted to welcome Nicolette Moonen, the Baroque string specialist, to coach the instrumentalists and Richard Roddis directed the singers. An enjoyable day was had by all. During the day we studied the works that feature in our next concert which will take place at Beeston Parish Church on Saturday, March 7th at 7.30pm. This is a very exciting programme entitled “Royal Baroque”. Most of the music being performed was composed by musicians serving in the French Court of Louis XIV at Versailles. 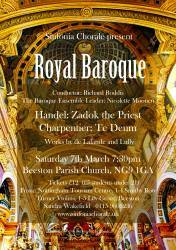 The concert also includes Zadok the Priest, the most famous of the Coronation Anthems by Handel. Richard Roddis will be directing the choir and Nicolette Moonen will be leading the Baroque Ensemble. 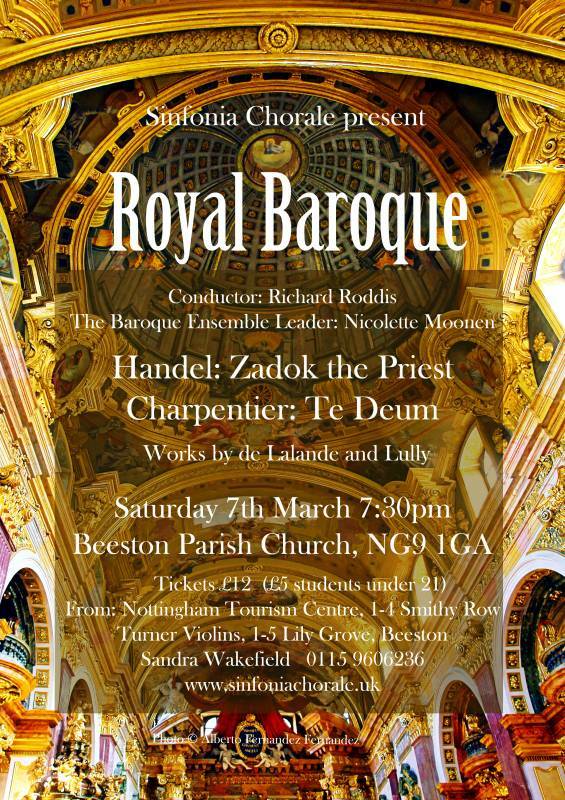 This will be a wonderful opportunity to hear this rarely performed French music in the lovely setting of Beeston Parish Church. Summer Concert at West Bridgford Methodist Church with members of the talented Kanneh-Mason family. Hosting the Bergedorfer Kammerchor from Hamburg - the choir we visted in 2014.